Cohen postponed his testimony due to ongoing threats against his family, the New York Times reports. He was initially scheduled to speak before the House Oversight Committee on Feb. 7, at the invitation of Rep. Elijah Cummings (D., Md.). "By advice of counsel, Mr. Cohen’s appearance will be postponed to a later date. Mr. Cohen wishes to thank Chairman Cummings for allowing him to appear before the House Oversight Committee and looks forward to testifying at the appropriate time. 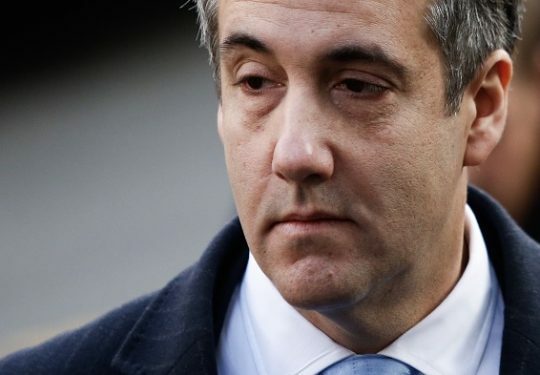 This is a time where Mr. Cohen had to put his family and their safety first," Cohen's attorney, Lanny Davis, said in a statement. Davis also pointed to "ongoing threats against his family from President Trump and Mr. Giuliani, as recently as this weekend, as well as Mr. Cohen’s continued cooperation with ongoing investigations," as reasons for his client postponing his testimony. Trump has suggested Cohen's father-in-law, Fima Shusterman, is guilty of unspecified crimes. "In order to get his sentence reduced, he says, I have an idea, I’ll give you some information on the president. Well, there is no information. But he should give information maybe on his father-in-law, because that’s the one that people want to look at," Trump said with reference to Cohen and his father-in-law. On Sunday, Rudy Giuliani, the president's current personal attorney, said Shusterman "may have ties to something called organized crime." Cohen's testimony was expected to focus on his past with Trump, according to the Wall Street Journal. Mr. Cohen’s testimony was expected to focus on his life story, examining how he went from serving as one of Mr. Trump’s most loyal aides for more than a decade to publicly breaking with him last year and implicating him in two federal crimes. However, his testimony was expected to be highly restricted to avoid interfering with the special counsel’s Russia investigation. He was also expected to be limited in what he can say about the continuing Manhattan U.S. attorney’s office investigation. Cummings and House Intelligence Committee Chairman Adam Schiff (D., Calif.) responded by acknowledging Cohen's expressed concerns but also emphasizing that "not appearing before Congress was never an option." "When our Committees began discussions with Mr. Cohen’s attorney, not appearing before Congress was never an option. We will not let the President’s tactics prevent Congress from fulfilling our constitutionally mandated oversight responsibilities," the lawmakers said in a statement. This entry was posted in Politics and tagged Donald Trump, Elijah Cummings, Michael Cohen. Bookmark the permalink.